A mile-high introduction to Office 365 OR Some of the latest Office 365 updates. Office 365 is not like any other version of Microsoft Office. In this short overview video, we highlight some of the many benefits of Office 365. Businesses are making the move to Office 365 faster than any previous version of Office. Our software solutions consultant shares some of the most recent Office 365 updates. You can read more about the various Office 365 update channels. You'll see these updates when they align with your channel for release. With Office 365 Groups you get several helpful tools that will help you and your team work better and more efficiently together, either as an ongoing team or on a specific project. Modern Groups can be short-lived, like a small project or event, or long-lived like a Sales Team. An Office 365 Group provides members of the group with more than just a distribution list, you get a Shared Group Calendar, and a Cloud location for Group/Team files that are accessible from most devices. Learn more about groups in my post, What Are Office 365 Groups? Start a PowerPoint at your office, from your desktop PC and share it for review with a colleague before you head off to your appointment. While you're on the go, you get an update notice on your mobile phone, open to review, make a minor change and provide a few other suggestions. As your day is pushing forward, and just after you've grabbed that afternoon cup of coffee at your favorite coffee shop, your colleague sends you a message in Microsoft Teams for a final review. They want to meet and review with you and the others on your presenting team. With the Meet Now feature all available team members join the call, and not only see the PowerPoint but are able to edit the same PowerPoint deck to finalize. You're now set for the next morning's presentation. Office 365 drives team work. Microsoft Planner is a group or team-based task management tool. Way more powerful than Outlook tasks, and unlike Microsoft Project, it’s easy to use and part of the Office 365 toolkit. Bring accountability and transparency to tasks needed for success. With Planner, you can create tasks, assign them, reassign them, attach group files to them, and track your progress with status updates and comments. Microsoft Planner is available for Windows, iOS and Android. On lots of different Teams or Projects? No problem: the Planner Hub rolls all your tasks across projects to your personal task list to help you stay organized and focused. 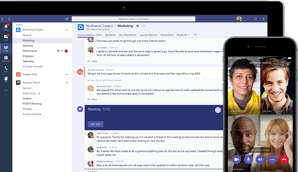 Microsoft Teams is a collaboration tool that provides a hub for teamwork where you can work around your content. Microsoft Teams provides a means to communicate through chats and online meetings with your colleagues both inside and outside of your organization (if external access is turned on). Microsoft Teams pulls together many of the collaborative tools of Office 365 into one application. Both a browser and desktop version are available. Access your Team files and Planner tasks right in Microsoft Teams. Teams even provides the ability to access third-party tools within your Team hub. From Adobe Creative Cloud, to GitHub, or Jira to SurveyMonkey and Zendesk, you can pull data from the tools your team uses, into a central location where you can collaborate together around related content and conversations. Learn more about in my post, An End-User Introduction to Microsoft Teams. The engine under the hood for Office 365 Groups and Microsoft Teams is SharePoint. All these pieces connect and work seamlessly together. Not usually leveraged for short-lived groups, but very useful for teams or long-term projects, is a SharePoint Team Site. Easily access files or see what’s trending with the people and documents that are part of the Group. With a Team Site, you can post news and information, videos or add connectors for things like GitHub, Google Analytics and a plethora of other connectors. It’s super easy too! You get enhanced document management with your SharePoint document libraries and if you want to automate some processes and workflow you'll be able to do that with Microsoft Flow. Download our free eBook: How to Get Your Team to Use Office 365. Watch our 30 min video: Sharing and Collaboration with Office 365. Editor's Note: This post was originally published in May 2015, but has been thoroughly revamped and updated for accuracy and comprehensiveness.